As we transition to spring from fall, it is not too soon to start thinking about the latest outdoor furnishing trends for 2018. Clients are starting to think about their outdoor spaces like another room and are spending more of their budgets outside when undertaking outdoor aquatic expansions where the a pool and spa are the focal point of their outdoor environments. 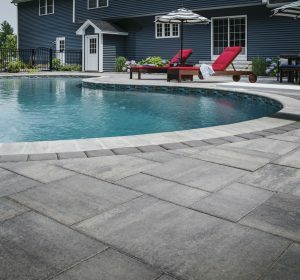 This trend is driving manufacturers to devote more attention to outdoor lines as part of their collections. It’s no longer about clunky, cheap outdoor furniture- clients are demanding high design for their outdoor furnishings. The cold modern concrete look is on its way out as is plastic faux wood furniture. It’s now about natural materials, retro- inspired style and cool, soothing colors. •	Taking the indoors out- A growing trend is the seamless transition from your home to the outdoor space, using ottomans and side tables, outdoor rugs, layered blankets and throw pillows. The backyard has now become an extension of your indoor space, decorating it with furniture and décor that looks like it was created for the indoors. Accessories are a big trend following this transition and outdoor lanterns, planters and even mirrors are in vogue completing the look and feel. •	Fabrics and pillows- The increased selections of textures, colors, prints and patterns for weather resistant outdoor fabrics continues to mushroom. This means that they now have the look and feel of what you would traditionally use inside. Soft coastal pastel colors will continue to be popular and textured solids looking like woven jute. Oversize cushions, like we saw indoors five years ago are now finding their way outdoors. •	Furniture design- We will continue to see the design evolution to more complex material choices in our furniture. This is being driven by consumer demands. We are seeing two materials in a singular design like teak and metal and steel and rope. There is also a retro trend with natural woven styles, like rattan and wicker making a comeback and in some instances in non-traditional colors like light blue and parchment red. Solid hard wood tables and chairs are increasing in popularity and they age beautifully over time. Mosaic inlaid tables are also popular, especially as accent side and bistro coffee tables. •	So hot- We are seeing a trend moving from traditional round shaped fire pits towards rectangular and linear fire pits and burners. •	Nap time- We are seeing a spike in daybeds finding their way onto the backyard patio space. Why not take a snooze outdoors? •	Put on your shades- Outdoor living should be enjoyed without the threats of sun induced medical risks, so we see a continuing trend in providing shade to outdoor expansion spaces. Large umbrellas and awnings are hot items that will continue to dominate expanded outdoor rooms. IVY STUDIO LLC, a landscape design consulting firm based in Massachusetts stays on top of major trends in outdoor furniture designs as well as other aspects of your outdoor design expansions where a pool and spa are the focal point. Contact us at 781-591-0300 or vern@ivystudioiMA.com to learn about our services. The initial consultation is a no obligation one.